Home Informations Guides and Advices for Chihuahua The dangers for a Chihuahua, Guide and Advices. The dangers for a Chihuahua. The Chihuahua is a small dog apparently so fragile that almost everyone is afraid to “break” even taking him in hand. Thinking this risk more than a few times to deny him the right to be a dog. But indeed some fears may be well founded. Risks for the chihuahua at home. At home, the Chihuahua is a basically hyperactive dog at a young age and more quiet and sleepy in adulthood. The biggest problems, in fact, can arise mainly when this puppy, as jumps, runs and does not have a clear sense of danger. In fact it is not too uncommon try to jump down from the arms of their masters or from the couch cause injuries too seriously. This is because, a few months, the Chihuahua have not yet fully formed skull, thus making it possible, often, the response in these subjects the so-called ‘open fountain’. Well, falling badly from a high surface area, they are likely to provoke serious damage at this point with consequences such as concussions. Or, given their strong curiosity, could cadergli some clothes risking broken limbs, in this breed, unfortunately, they are not difficult to see. Suggestions are few but good. Following him, surely, always at home, when you are there to watch him, and when that is not possible to buy a recintino for dogs to be put in a room safe. Using the fence it will be possible also to accustom, with the method called by some “of the four sides” , to have its spaces. This is accomplished by putting on one side of the bunk where he can rest, on the other hand the food and water, some games, and other corners of the sleepers to teach him that there you do the needs. The reason is that dogs instinctively tend to seek their own corners or spaces a bit ‘longer confined to expel their faeces. Some Chihuahuas may also suffer from patellar dysplasia that could go worse if the dog face many stairs or poorly-aimed jumps. For this reason, the first suspect in the above condition, it is good to all control test that will recommend your veterinarian. Risks for the Chihuahua outside the home. The Chihuahua and other dogs. 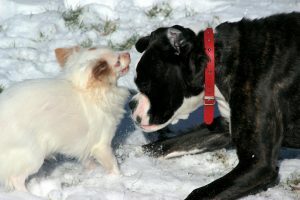 It is not just the belief that the Chihuahua should not socialize with other dogs, indeed! He must learn as well to deal with other subjects of the same species, so then to avoid behavioral problems. It is wrong , most of the time, pick him up at the sight of another dog for fear that it will hurt themselves as well as we would only increase his fears and aggression, precisely as a result. At this, however, we must also add that it is not even wise to let him play with other very large impetuous dogs that might unintentionally hurt him even with a paw. 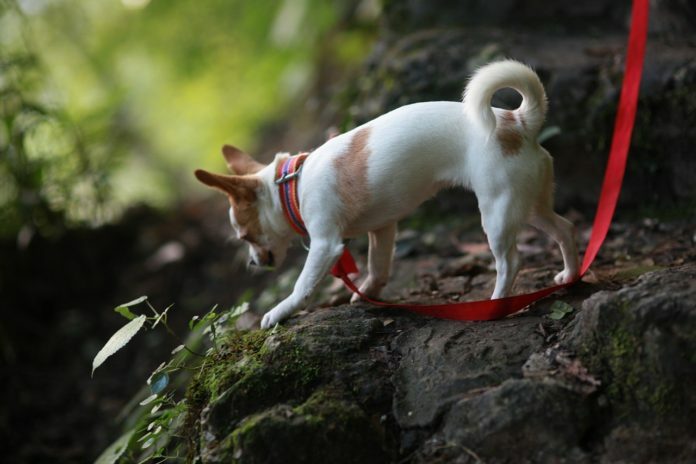 Chihuahuas, especially of small size or very young, likely on hot days to go hypo and that is why it is suggested to add in the height of summer a little bit of water or fructose, when you go traveling, to bring always behind a little ‘honey for emergencies. This is however best explained in the article on the chihuahua pathologies .? These are definitely some of the dangers that could run our chihuahua! And to you? You can think of others? What are your fears? Next articleCool video of a chihuahua in travail!